Launch the best burger restaurant in Zoo-Town! Start with the Food Truck and grow it into a famous Zoo Restaurant! The fridge packed with all necessary ingredients is all you need to reach your goal. Ready? 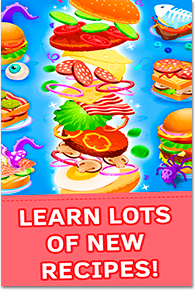 Your mission is to master your cooking talent, learn new recipes and become the chef beyond compare. 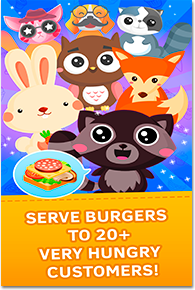 Hungry animals can’t wait to try your delicious burgers! Grab your apron – let’s make burgers and sandwiches! Drag items from the fridge to make your perfect dish. 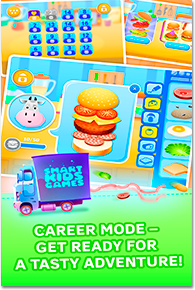 In this chef cooking game food never runs out and all ingredients are delivered right from the farmer market so that you could have the perfect setup for preparing delightful dishes! 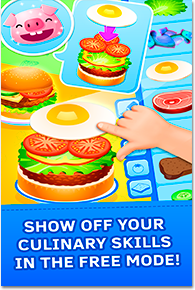 How to play this kitchen game for kids: select a burger ban or sandwich bread, add vegetables and meat. And don’t forget to decorate your masterpiece with a special sauce. But be careful! Throw away expired products on time! And, if everything is right the customers will be happy and you will be closer to opening the restaurant of your dreams! What will you find inside this animal restaurant game about cooking? * Zoo Restaurant is fun for kids of all ages and adults as well! Warning! Don’t play these restaurant serving games on empty stomach since the treats look sooooo mouthwatering! Yum!